The amount that was (will be) charged to the guests credit card within 6 weeks prior to arrival is not refundable in case of a cancellation, no show or reduction in numbers. With a 24hr reception, centrally located and only a 7 minute walk from Gara de Nord train station, we at Friends Hostel are here to ensure that you get the most out of our lovely city. We make it our mission to provide our guest with the all the tools necessary to discover the hidden gem that is our home, with free maps, directions and insightful advice on anything and everything Bucharest and Romania. As we are located close to the student area and provide some of the best rates in town, keeping to that all important budget should be easy as you discover the nearby cheap bars (€1.20 beers), restaurants (€2.20 lunch menu with traditional food), clubs and the city's coolest attractions all within walking distance. Come see and feel the charm of our friendly house, recently renovated to ensure you feel right at home. Chill in our lounge and interact with other travelers, play games or even put a movie on the cinema projector and relax. We also boast a spacious kitchen with everything you need to whip up something delicious, hot showers, free WIFI, towels, air-conditioned rooms, computers, lockers in the rooms, coffee and tea all day. L'ostello è molto carino e le ragazze che lo gestiscono sono state molto gentili. La camera era pulita e attrezzata col condizionatore d'aria che è servito molto visto che eravamo in mansarda. La zona un pò fuori dal centro mi è piaciuta; i prezzi dei ristoranti e dei market erano molto più bassi e vicino c'è la metro che ti porta velocemente in centro. Mi sono piaciute molto le ragazze al desk: mi hanno fatto stampare il check in dell'aereo e hanno prenotato il taxi che è arrivato in 2 minuti. Very friendly and professional receptionists. I loved the room, the space, the atmosphere. Friends Hostel is nice, not really in the centre of the city, is near the central Station of Bucharest. there is a small breakfast every morning. 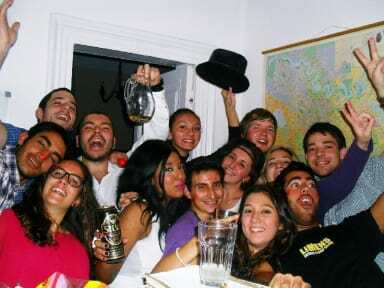 there are a lot of people from different part of Europe and it's interesting if you are a young traveler. Tutto sommato siamo stati bene durante le 4 notti di Novembre,la posizione era molto favorevole e vicina ad un locale di musica dove siamo andati per 3 notti,così come alla stazione di Gare du Nord. Il personale è stato gentile,il ricevimento rimaneva 24 ore, e questo era fondamentale! L'atmosfera è andata spegnendosi perchè l'ultimo giorno siamo rimasti in pochi in ostello. La mattina ci siamo svegliati un po infreddoliti e non sentivamo il riscaldamento.